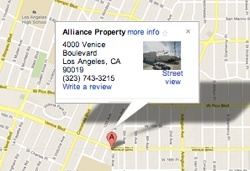 Alliance Property Management is LA's leading property management solution. We bring you the highest level of expertise, service, and professionalism. We work closely with our clients to fully understand their investment goals, and then use our wide range of services to transform these goals into reality. Maintain and keep your rental property in good condition. ALLIANCE PROPERTY MANAGEMENT – OUR CREDENTIALS . . .
We encourage you to check our references. We are proud of our work. In short, we help you get the most from your property and free you to pursue other activities.